Finally, it is “soup weather” here in San Diego, just a week until Thanksgiving. Inspired by Ina Garten’s gorgeous new cookbook Make It Ahead, I adapted her parsnip and pear gratin and made soup today. This is a nice starter for a fall dinner party or makes a cozy lunch on a chilly day, “chilly” being anything below 70 degrees here in Southern California. Always alert for ways to cut fat and salt, I cut out the eggs and sour cream in Ina’s tempting gratin. Same with the salt – she really overdoes it in most of her recipes, at least to my taste. We have watched salt since Larry’s heart attack in 2011, so taste yours and season it to your liking. TIP: I tried to use my immersion blender, hoping to avoid cleaning either the blender or food processor, but it just didn’t get the soup as creamy as with my Vitamix. 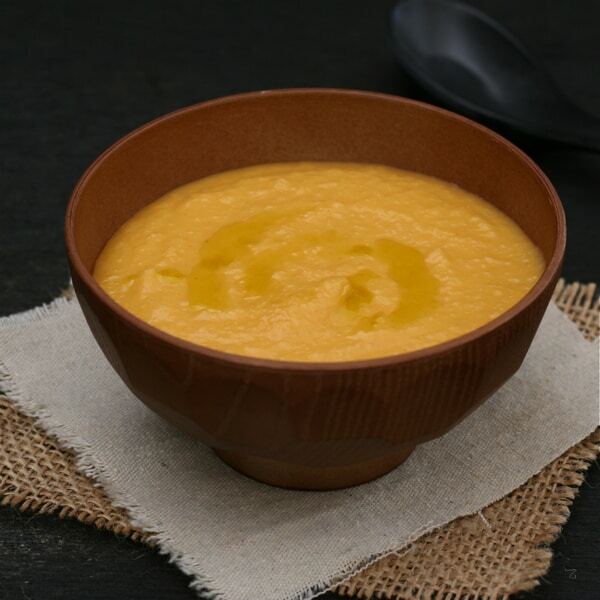 A creamy pear and parsnip soup, a perfect starter for autumn dinner parties. Heat the oil in a large, heavy-bottomed pot, such as a Dutch oven. Add the parsnips and pears and cook over medium heat for 3 minutes, without browning. Add the vegetable stock, salt, pepper and nutmeg. Bring to a boil, then lower heat, cover and cook until pears and parsnips are tender, about 20 minutes. Using either a blender or processor, purée soup until smooth. Add cream and taste for seasoning. Simmer until soup is heated through, about 5 minutes. Ladle into bowls, garnish with truffle oil and serve. It’s been soup weather here for a while. How nice that I now have a new soup to add to my rotation, thanks, Liz! Happy Thanksgiving, Steve, to you and your family. Now thats a beautiful bowl of soup, love the combination. I think I would like it much better than the gratin. Happy Thanksgiving Liz. Happy Thanksgiving, Suzanne – is has been a rough six weeks for both of us, but we have so much to be thankful for, yes? That is one beautiful bowl of soup! Thanks, Dorothy – Happy Thanksgiving to you and your family. Indeed it is, Greg, and I should use it for more than morning smoothies and soups. Hope your Thanksgiving went well, too – I am keying down for Christmas – just the two of us for a change. Time alone with Larry feels so appealing this year – plenty of time with friends before and after Christmas.